Brian graduated from Tidewater Tech Aviation in 2001 in Virginia Beach, VA while he was serving 12 years in the U.S. Navy. 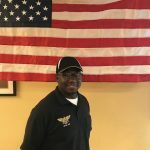 After being honorably discharged, his willingness to serve prompted him to join the Ohio Air National Guard and currently has served 6 years as a Staff Sergeant. Brian has been very active in TWU Local 572 since his employment at American Eagle in 2002. He has progressed from Shop Steward, Vice-Chairman and currently serving as Local 572 Recording Secretary because of his passion for protecting our members and dedication to the local.